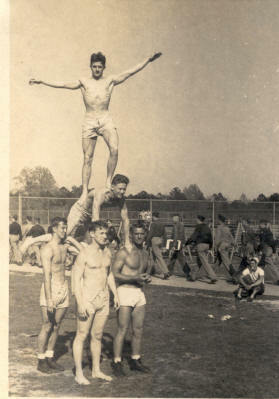 These pictures and notes are from my days in the World War II Navy V-12 and Naval Reserve Officer Training Corps at Duke University, Durham, NC. The period was from November 1, 1943 to February 28, 1946. I should mention that I was too small to enter sports with "the big guys," so I did the types of things where size didn't matter. I weighed only 118 pounds when I arrived, and about 130 at graduation. In fact, I was so small the supply office could not get a uniform for me for about six weeks. Every morning at "muster," people would demand to know why I was not in uniform. Soon after I arrived at Duke I met Ed Stancik, a marine who had transferred from another school and was ahead of me in the officer training program. He became my teacher in gymnastics. 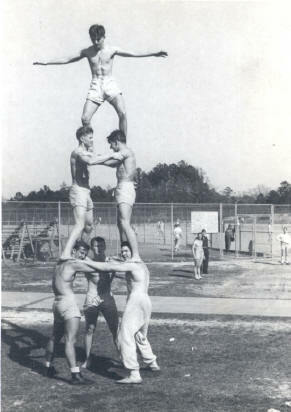 In the wartime program at Duke we didn't have a coach for gymnastics. Ed's picture was taken on the roof of the swimming pool at the gym. Fortunately for me, I had been doing some gymnastics before I arrived, and soon became an unofficial physical training assistant. So, in the winter snow, I didn't have to go outside for physical training. 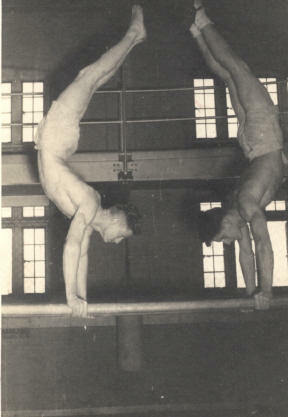 Ed taught me to do giant swings on the horizontal bar and some maneuvers on the parallel bars and flying rings. Before I arrived at Duke an elderly man had taught me the reverse kip. 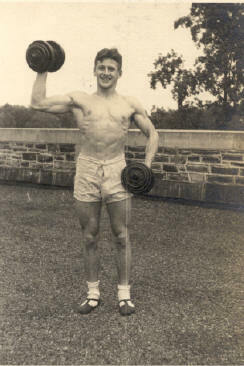 For about two years I was the only guy at Duke who could do one-arm pullups. You can see that my form was not very good. Later I learned to keep my feet together. Although being far from Olympic stature, we did pretty well. Whipping around the horizontal bar involved quite a bit of force. One time while doing giant swings on that bar, I pulled one of the support cables out of the floor, and the whole thing came crashing down. Ed and I tried to develop some routines together, but we didn't have much time for it. 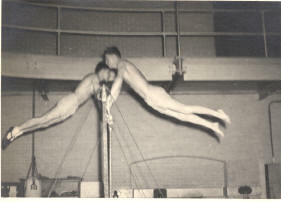 Here we are on the parallel bars. In this shot Ed is teaching me to do a running back flip. Later, I learned to do a running front flip and a back flip without running. A lot of the following pictures were taken all on the same day. Being over 70 years old, some of them are deteriorated. 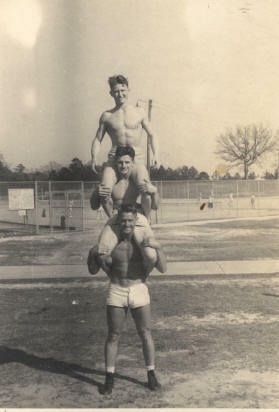 Above, Ed Stancik is at the top, I'm in the middle, and our PT instructor, Navy Chief Gant is at the lower right. Avove, I'm on top, Ed Stancik is in the middle, and Chief Gant is holding both of us. All these pyramids were done under Ed's guidance. In the one above, Ed and I are in the middle. Above is another type of pyramid, with Ed and me in the middle. Here, several of us are doing handstands. Ed was very good at this. 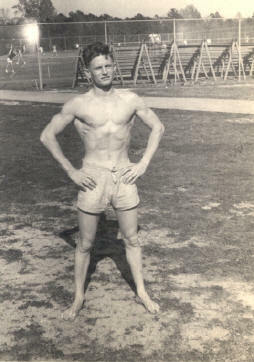 Often, after our workout in the gym, he would walk on his hands the length of the gym (about 150 feet) and down the stairs to the ground floor to the showers. He was also a good student, being in an honors program in mathematics. The only other sports thing I did was pole vaulting. I wasn't very good at it, but it did get me on the track team. Again, there was no coach for this type of thing. Toward the end of my training there was an intramural wrestling tournament, and I took second place in my weight category. Our scholastic efforts were with the standard bachelor of science subjects along with some purely Navy subjects like seamanship, celestial navigation, Naval customs and etiquette, morse code, semaphore and marching. After graduation with a Naval Reserve commission as ensign, I was part of a group of about 2,000 new ensigns who were sent to Newport, Rhode Island for a training cruise, but mainly for personnel processing, as people were signing up for various schools or other assignments, and for being released to inactive duty in the Naval Reserve. After a period of training in shipboard fire fighting, we boarded four light cruisers: Denver, Montpelier, Columbia and one other which I can't remember. We went to Bermuda, the City of Quebec, the New London submarine training school, and had some gunnery practice out in the Atlantic. During our visit to New London I got to experience some dives in a submarine. I was released to inactive duty on July 11th, 1946.